When the University of Oregon and Autzen Stadium is just minutes away, it's easy for Oregon Duck fans to get their athletic fix staying at our Eugene hotel. Do you need to be close to Hayward Field? In town for an exciting Oregon Ducks football game? You need clean, value-driven accommodations that are conveniently located next to all the action. Our Eugene hotel is located close to the Matthew Knight Arena and adjacent to the University of Oregon. We offer close proximity to the Autzen Stadium, Hayward Field and we're adjacent to the Matthew Knight Arena for your convenience. University of Oregon football games at Autzen Stadium are a big reason why many guests choose our Eugene hotel. Track and field events at Hayward Field are popular during the warmer months. Of course, families and loved ones visiting, dropping off and picking up students at the University of Oregon also want a great location and well-appointed guest rooms, which we always deliver. From concerts and shows at the Matthew Knight Arena to simply enjoying the unique boutiques and fine dining downtown, there's something for everyone close to our Eugene hotel. We offer close proximity to the Lane Events Center, Hult Center, and PK Park, are near the Eugene Marathon, and we're minutes from the Oregon Country Fair. The University of Oregon conference events bring in business travelers and academics from around the world. Our Eugene hotel is also a favorite for employees of the Municipal and Federal Courthouse. There are many construction jobs happening in the region, and we're happy to be a home away from home for contractors and workers. After a long day of work or play, cozy accommodations are in order. 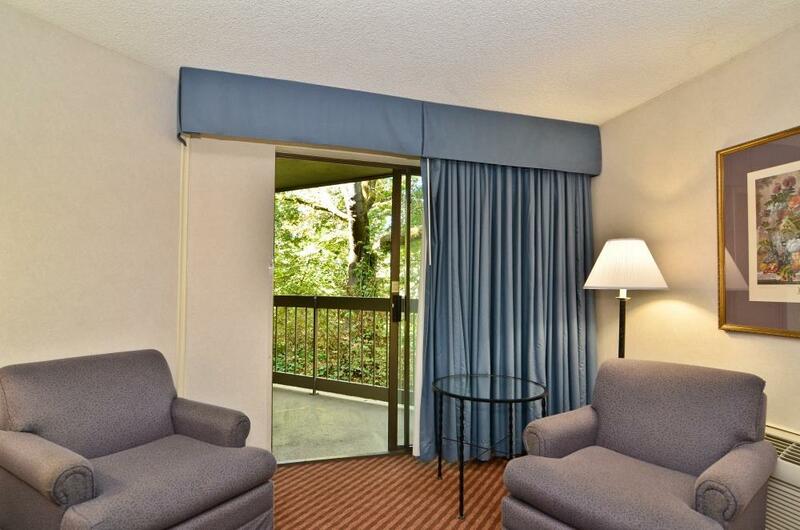 Book your quiet room at Best Western Greentree Inn and be close to everything Eugene offers! We have a limited number of pet rooms available. Please make sure the room you are booking says PET FRIENDLY. Regrettably your pet will not be allowed in a non-pet room. From: Interstate 5 North. Take Exit 192, follow signs to University of Oregon and the Best Western Greentree Inn is adjacent to the University. From: Interstate 5 South. Take Exit 194B, follow the signs to University of Oregon to the Best Western Greentree Inn.